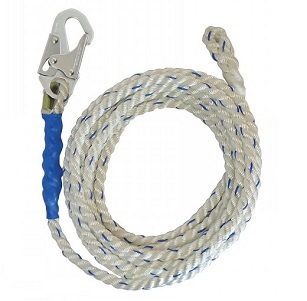 PRODUCT: 5/8 INCH X 75 FT. VERTICAL LIFELINE POLYESTER ROPE WITH LOCKING SNAP-HOOK ONE END STEEL THIMZBLE AT OTHER. PRICE/EACH. • Locking Snap Hook at on end, Steel Thimble at Other. • Gate meets 3600 lb strength. • 5/8” Polyester Rope, Tensile Strength of 8,500 lbs. • Superior Resistance to Abrasion and UV Light. • Five-Tuck Splice for Superior Strength and Safety. • Protective PVC Shrink Tubing Protects the Spliced Ends. • Meets the Requirements of OSHA 1926 and ANSI Z359.2007.